© Khadem-Ansari et al. ; Licensee Bentham Open. It has suggested that grape juice consumption has lipid- lowering effect and it is associated with a decreased risk of heart disease. We aimed to evaluate the effects of red grape juice (RGj) consumption on high density lipoprotein-cholesterol (HDL-C), apolipoprotein AI (apoAI), apolipoprotein B (apoB) and homocysteine (Hcy) levels in healthy human volunteers. Twenty six healthy and nonsmoking males, aged between 25-60 years, who were under no medication asked to consume 150 ml of RGj twice per day for one month. Serum HDL-C, apoAI, apoB and plasma Hcy levels were measured before and after one month RGj consumption. HDL-C levels after RGj consumption were significantly higher than the corresponding levels before the RGj consumption (41.44 ± 4.50 and 44.37 ± 4.30 mg/dl; P<0.0001). Also, apoB was significantly increased after RGj consumption (149.0 ± 22.35 and 157.19 ± 18.60 mg/dl; P<0.002). But apoAI levels were not changed significantly before and after of RGj consumption (154.27 ± 21.55 and 155.35 ± 21.07 mg/dl; P>0.05). Hcy levels were decreased after RGj consumption (7.70 ± 2.80 and 6.20 ± 2.30 µmol/l; P<0.001). The present study demonstrates that RGj consumption can significantly increase serum HDL-C levels and decrease Hcy levels. These findings may have important implications for the prevention of atherosclerosis in healthy individuals. Keywords: Red grape, lipids, lipoproteins, homocystein, athersclerosis. Consumption of grape flavonoids has been shown to confer antioxidant protection, inhibit platelet activity, reduce thrombus formation and lead to the concentration of inflammatory biomarkers [1, 2]. This effect may be considered to be beneficial for the prevention of cardiovascular disease . In vitro studies showed that grape juice has significant antioxidant activity and can inhibit oxidation of low density lipoprotein (LDL) [1, 2]. Also, red grape juice (RGj) supplementation improves the lipoprotein profile by decreasing plasma concentrations of LDL and increasing those of high density lipoprotein (HDL) and greatly reducing the plasma concentrations of oxidized LDL . Apolipoproteine B (apo B) is required for lipoprotein synthesis and secretion . The catabolism of LDL that depends on the recognition of cellular receptors by apo B allows researchers to assess the risk of cardiovascular disease . On the other hand, RGj consumption is associated with significantly lower cholesterol/HDL as atherogenic index, which is commonly used as the best lipid parameter for determining human heart disease risk . Recently, meta-analysis of four large prospective studies has showed that for about 2% increase from an individual with normal high density lipoprotein–cholesterol (HDL-C) level, the incidence of coronary events decreases by 2% in men and 3% in women . An increase in HDL-C is mainly due to an HDL3 subfraction increase. However, Rakic et al., reported that increases in apo AI and apo AII occur in HDL3 and HDL2 subfractions and that the changes in apo AI and apo AII were comparable and parallel to those of HDL-C . The newest independent risk factor for cardiovascular disease is excess levels of homocysteine (Hcy) . Hcy, a non-protein-forming sulfur amino acid, is an intermediate in methionine metabolism . Although severe hyperhomocysteinemia is rare among the general population, mild hyperhomocysteinemia has been reported in 7% of the general population and up to 30% of patients with coronary and peripheral vascular disease . Levels only 12% above the upper limit of normal plasma Hcy are associated with a 3-fold increase in the risk of acute myocardial infarction [8, 10]. Studies reported that grape juices and grape skin extracts could prevent Hcy-induced endothelial dysfunction . The aim of this study was to evaluate the effects of Iranian RGj consumption on HDL-C, apo AI, apoB and Hcy levels in healthy human volunteers. Twenty six healthy and nonsmoking volunteers males aged 25-60 years, who were taking no medication, were asked to consume 150 ml of pure RGj twice per day for one month. The RGj used in this project provided by UromNarin Co. (Urmia, Iran) and contained a total antioxidant capacity of 9.6mmol/kg and 19.09mg/dl of phenolic compounds (analyzed by Chemical Laboratories for Food Stuff-Water-Environmental Analysis, Germany). All volunteers continued their habitual diets during the study. Blood samples were drawn after fasting for 12 hours before study entry and after one month of RGj consumption. Blood was collected and allowed to clot for 15 minutes at room temperature and then centrifuged at 4000 rpm in a bench centrifuge for 10 minutes. For Hcy assessment, blood was collected in tubes containing EDTA-K2 (1mg/ml) and then plasma samples were separated. Serum and plasma samples were immediately stored at -80 ºC until analysis. HDL-C was measured by direct enzymatic method using automated chemical analyzer BT-3000 (Biotecknica instruments, Italy). Serum apo AI and apo B concentrations were measured by nephelometric methods involving a reaction with specific antiserum to form an insoluble complex using mini nephelometric instruments (Binding Site Co., UK). Total plasma Hcy levels were measured by enzyme immunoassay (EIA) method using an EIA kit (Axis-Shield Diagnostic Co., UK). Statistical analysis were performed by student’s paired t-tests and results are given as means±SD. Statistical significance was accepted as p<0.05. Figures show the serum HDL-C, apo AI, apo B and plasma Hcy levels before and after one month RGj consumption. HDL-C values were 41.44 ± 4.50 mg/dl and 44.37 ± 4.30 mg/dl before and after RGj consumption, respectively (p<0.0001; Fig. 1). Serum apo B levels measured 149.0 ± 22.35 mg/dl and 157.19 ± 18.60 mg/dl before and after RGj consumption, respectively (p<0.002; Fig. 2). Serum apo AI measured 154.27 ± 21.55 mg/dl and 155.35 ± 21.07 mg/dl before and after RGj consumption, respectively, which show that it was not changed significantly (p>0.05; Fig. 3). Plasma Hcy levels were 7.70 ± 2.80 µmol/l and 6.20 ± 2.30 µmol/l before and after RGj consumption, respectively, thus indicating a significantly decrease (p<0.001; Fig. 4). HDL-C concentration before and after red grape juice consumption (p<0.0001). 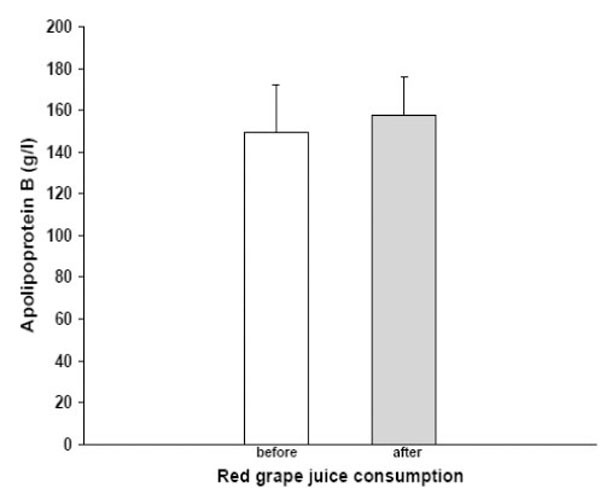 Apolipoprotein B concentration before and after red grape juice consumption (p<0.002). Apolipoprotein AI concentration before and after red grape juice consumption (p>0.05). 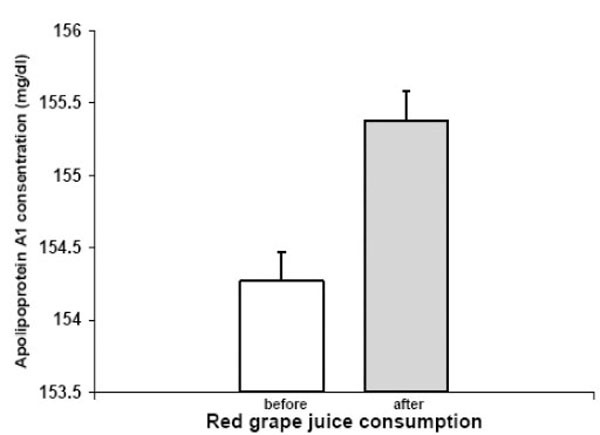 Homocysteine concentration before and after red grape juice consumption (p<0.001). The protective effects of fruits and vegetables against coronary heart disease (CHD) and myocardial infarction have been reported in numerous populations worldwide . Studies on the Mediterranean and French diets show that low rates of cardiovascular disease occur despite diets being rich in saturated fat and cholesterol . The Mediterranean diet is rich in polyphenolics from vegetables and fruits, especially red grape, and these components are likely to confer some cardioprotective effects [13-15]. The Lyon heart study showed a 76% reduction in clinical events in subjects consuming a Mediterranean diet [13, 16]. For some individuals, dietary and lifestyle modification may be all that is needed to prevent CHD . The bioavailability of dietary polyphenols, including those from grape derivatives, has been shown previously by many authors . Ingestion of concentrated RGj as a polyphenol-rich dietary supplement exerts hypolipidemic, antioxidant and anti-inflammatory effects in healthy subjects . 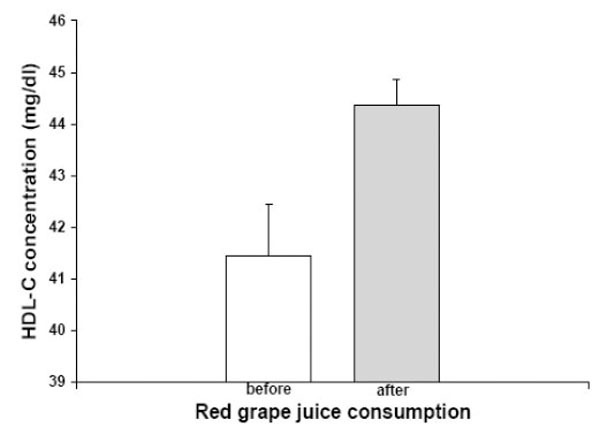 Purple grape juice consumption improves endothelial function and reduces the susceptibility of LDL cholesterol to oxidation in patients with coronary artery disease . Castilla et al., showed RGj supplementation is associated with parallel reductions in the concentrations of both LDL-C and apo B, and increases in HDL-C and apo AI . However, Coimbra et al., reported no effect on apo B, apo AI and HDL-C levels after consumption of purple grape juice in healthy individuals for 14 days . Auger et al., clearly demonstrated that consumption of polyphenol extract of RGj reduced plasma apo B concentration with no effect on apo AI . Although, we show that RGj supplementation increase apo B and increase HDL-C levels but do not have a significant effect on apo AI concentration. This discrepancy may be related to differences in the composition and concentration of polyphenols in the RGj concentration in different studies. A polyphenol level of 19.09 mg/dl in the present work compares with that of 644 mg/dl in Castilla et al., study. HDL-C is known to be a significant and independent predictor of CHD risk . A significant increase found in plasma levels of HDL-C in subjects receiving RGj for 14 days [21, 22]. However, Aminian et al. showed that unripe grape juice consumption had no incremental effect on serum HDL-C levels in healthy individuals . Hcy is an independent risk factor for vascular disease  and high circulating Hcy concentration is associated with an increased risk of occlusive vascular disease [8, 23]. Many studies indicate that Hcy-induced vascular injury involves oxidative stresses. Hcy is able to produce O2- and other free radicals by autoxidation in the presence of metals. Our study showed that RGj consumption lowers Hcy levels. Lower Hcy concentrations may introduce another possible mechanism for the vascular protective effects in populations that consume RGj. To our knowledge, no other study has investigated the direct effects of RGj consumption on serum Hcy levels, and in this sense, our work was the first study to show that RGj consumption decreases Hcy levels and may be helpful to prevent CVD. This research was supported by a grant from Sarouneh laboratory research units. We are grateful to Sarouneh stuffs in helping this research work. Castilla P, Echarri R, Davalos A, et al. 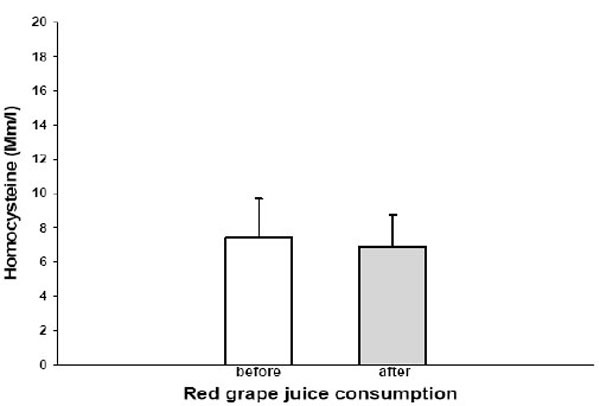 Concentrated red grape juice exerts antioxidant, hypolipidemic, and antiinflammatory effects in both hemodialysis patients and healthy subjects Am J Clin Nutr 2006; 84: 252-62. O'Byrne DJ, Devaraj S, Grundy SM, Jialal I. Comparison of the antioxidant effects of Concord grape juice flavonoids alpha-tocopherol on markers of oxidative stress in healthy adults Am J Clin Nutr 2002; 76: 1367-74. Davalos A, Fernandez-Hernando C, Cerrato F, et al. Red grape juice polyphenols alter cholesterol homeostasis and increase LDL-receptor activity in human cells in vitro J Nutr 2006; 136: 1766-73. Auger C, Caporiccio B, Landrault N, et al. Red wine phenolic compounds reduce plasma lipids and apolipoprotein B and prevent early aortic atherosclerosis in hypercholesterolemic golden Syrian hamsters (Mesocricetus auratus) J Nutr 2002; 132: 1207-13. Vinson JA, Teufel K, Wu N. Red wine, dealcoholized red wine, and especially grape juice, inhibit atherosclerosis in a hamster model Atherosclerosis 2001; 156: 67-72. Eccleston C, Baoru Y, Tahvonen R, Kallio H, Rimbach GH, Minihane AM. Effects of an antioxidant-rich juice (sea buckthorn) on risk factors for coronary heart disease in humans J Nutr Biochem 2002; 13: 346-54. Belleville J. The French paradox: possible involvement of ethanol in the protective effect against cardiovascular diseases Nutrition 2002; 18: 173-7. Fu W, Conklin BS, Lin PH, Lumsden AB, Yao Q, Chen C. Red wine prevents homocysteine-induced endothelial dysfunction in porcine coronary arteries J Surg Res 2003; 115: 82-91. Jacques PF, Bostom AG, Wilson PW, Rich S, Rosenberg IH, Selhub J. Determinants of plasma total homocysteine concentration in the Framingham Offspring cohort Am J Clin Nutr 2001; 73: 613-21. Chen C, Conklin BS, Ren Z, Zhong DS. Homocysteine decreases endothelium-dependent vasorelaxation in porcine arteries J Surg Res 2002; 102: 22-30. Flesch M, Schwarz A, Bohm M. Effects of red and white wine on endothelium-dependent vasorelaxation of rat aorta and human coronary arteries Am J Physiol 1998; 275: H1183-1190. Houston MC, Cooil B, Olafsson BJ, Raggi P. Juice Powder Concentrate and Systemic Blood Pressure, Progression of Coronary Artery Calcium and Antioxidant Status in Hypertensive Subjects: A Pilot Study Evid Based Complement Alternat Med 2007; 4: 455-62. Pal S, Ho N, Santos C, et al. Red wine polyphenolics increase LDL receptor expression and activity and suppress the secretion of ApoB100 from human HepG2 cells J Nutr 2003; 133: 700-6. Hertog MGL, Kromhout D, Aravanis C, et al. Flavonoid intake and long-term risk of coronary heart disease and cancer in the seven countries study Arch Intern Med 1995; 155: 381-6. Zern TL, Fernandez ML. Cardioprotective effects of dietary polyphenols J Nutr 2005; 135: 2291-4. De Lorgeril M, Salen P, Martin JL, et al. Effect of a mediterranean type of diet on the rate of cardiovascular complications in patients with coronary artery disease. Insights into the cardioprotective effect of certain nutriments J Am Coll Cardiol 1996; 28: 1103-8. Aminian B, Massoompour SM, Sadeghalvaad A, Omrani GH. Unripe grape juice (verjuice) as a lipid-lowering agent: fact or fiction Arch Iranian Med 2003; 6(1): 32-4. Nigdikar SV, Williams NR, Griffin BA, Howard AN. Consumption of red wine polyphenols reduces the susceptibility of low-density lipoproteins to oxidation in vivo Am J Clin Nutr 1998; 68: 258-65. Stein JH, Keevil JG, Wiebe DA, Aeschlimann S, Folts JD. Purple grape juice improves endothelial function and reduces the susceptibility of LDL cholesterol to oxidation in patients with coronary artery disease Circulation 1999; 100: 1050-5. Coimbra SR, Lage SH, Brandizzi L, Yoshida V, da Luz PL. The action of red wine and purple grape juice on vascular reactivity is independent of plasma lipids in hypercholesterolemic patients Braz J Med Biol Res 2005; 38: 1339-47. Albers AR, Varghese S, Vitseva O, Vita JA, Freedman JE. The antiinflammatory effects of purple grape juice consumption in subjects with stable coronary artery disease Arterioscler Thromb Vasc Biol 2004; 24: e179-180. Castilla P, Davalos A, Teruel JL, et al. Comparative effects of dietary supplementation with red grape juice and vitamin E on production of superoxide by circulating neutrophil NADPH oxidase in hemodialysis patients Am J Clin Nutr 2008; 87: 1053-61. Dixon JB, Dixon ME, O'Brien PE. Reduced plasma homocysteine in obese red wine consumers: a potential contributor to reduced cardiovascular risk status Eur J Clin Nutr 2002; 56: 608-14.